Del Mar recorded its second official kill yesterday. (I say “official” because I have a suspicion – just a suspicion, mind you – that given all its bad publicity the past couple years, Del Mar has changed the criteria for which horses are to be included in its Stewards Minutes’ “Deceased” count. Put another way, I find it hard to believe that almost three weeks in only two horses have died while racing or training at Del Mar or Del Mar-related training facilities.) On the chart, 3-year-old Marvelous Kaos was a “took-a-bad-step, pulled-up-in-distress, vanned off” in the 2nd; the Daily Racing Form confirms he was euthanized. There’s no doubt in my mind that horse racing is hiding their dead even in the face of FOIA’s. Frank Stronach owned Magna “Entertainment” which is the umbrella corporation for his racetracks (Santa Anita, Golden Gate, Gulfstream) is clearly hiding their dead. They are deliberately, in conjunction with pro-horse racing entities, eliminating Race Replays of horses going down in the dirt on their tracks for starters. The next thing we know they are now hiding the identities of horses who die on their tracks by not disclosing their name, in most cases, which also protects the trainers who have racehorses dying in their care. Essentially, they protect these bastards. There will come a time when this will be challenged in court, and they will lose. 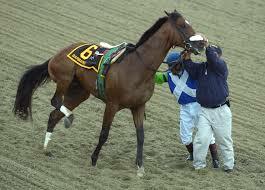 It will be a victory for the racehorses as we continue to be their voice. My heart aches for all racehorses who lost their lives this past week on racetracks all over North America. This is an utter disgrace that our politicians continue to support these hell holes, and continue to divert taxpayers money (in one form or another) to these hell holes when they know full well that they are not financially sustainable. Horse racing. It’s absolutely sickening. I hate it and the people who support it make me sick. The greedy, apathetic attendees just walk past us as if we don’t exist when we offer them leaflets and inform them that horses die regularly on racetracks nationwide. Join us at the gates of Del Mar on weekend races at 10:30 a.m.